Can they find the magic in a practical union? Mage of Inconvenience is not only the first of the Dreamspun Beyond books I’ve read, but it’s also the first of Parker Foye’s books I’ve read. Being a fan of the Dreamspun Desires line, I wasn’t quite sure what to expect. I knew the Dreamspun Beyond novels are contemporary romances with a paranormal twist, but I wasn’t sure if they would be as sugary sweet as the Dreamspun Desires line is. They’re not… or at least, Mage of Inconvenience isn’t toothachingly sweet. Quite the contrary, West and Julian’s story focuses more on the magic, the action, and thwarting evil than it does on their romance. Yet Foye makes their match believable through the use of some classic shifter themes, a good dose of opposites attract, and a side of “I don’t know if I want to kiss you or kill you” attraction between the two men. Because the story is told from both West’s and Julian’s point of view, we are privy to each man’s thoughts about their situation and the secrets they are keeping from one another. Granted, they kind of got thrown together unexpectedly and didn’t know one another well enough to know if they could trust each other with their secrets – and they both have some pretty big secrets. The dual points of view are vital for the reader to keep up with the goings on; I mean, I can’t imagine the story being as effective or intense had it been written from a single point of view. The shifting POV not only enabled the author to keep the reader “in the know,” but it also allowed for the narrative to shift from one character to the other when one started to think about his secret too much, thereby keeping the reader in the dark about certain things and revealing them at some rather intense moments. During one such revelation, not only did I mutter “Oh, no. No. No. No. No. No.” but it also typed it as note in my Kindle. Foye proved to be very good at using the shifting the points of view at just the right time to avoid spilling the secrets too early and then later sharing them at time that maximized their impact. The author also incorporates a red herring or two (maybe more) to keep the reader guessing as to who is behind the attacks on West and Julian. There are characters you know are involved, characters you think are involved but question how “easily” the evidence points at them, and characters I never saw coming, thereby giving a dash of mystery to the novel. I thoroughly enjoyed Mage of Inconvenience and should probably give it the entire five-stars. However, as I’m unsure that I’ll reread it, yet suspect that I’ll likely get it on audiobook should it be released in that format, I’m splitting the difference and giving it the rare 4.5-star rating (rare because I hardly ever use half-stars in my ratings). 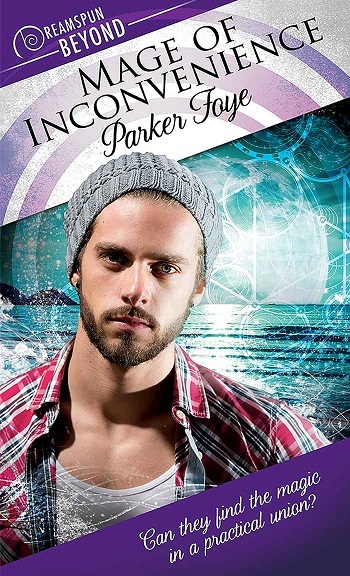 As I found myself entranced by the story, the magic, the action, the mystery, and yes, even the romance, as well as enjoyed the author’s writing, I will definitely be keeping my eye out for more of Parker Foye’s work. PARKER FOYE writes speculative-flavored romance under the QUILTBAG umbrella and believes in happily ever after, although sometimes their characters make achieving this difficult. An education in Classics has nurtured a love of literature, swords, monsters, and beautiful people doing stupid things while wearing only scraps of leather. You’ll find those things in various guises in Parker’s stories, along with kissing (very important) and explosions (very messy). And more shifters than you can shake a stick at. Originally from the UK and currently based in Canada, Parker travels on a regular basis via planes, trains, and an ever-growing library. 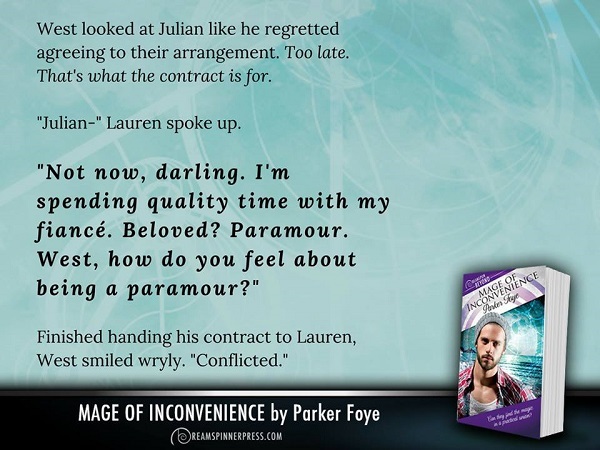 Reviewers on the Wicked Reads Review Team were provided a free copy of Mage of Inconvenience by Parker Foye to read and review.